Amazing view, waterfront chalet with stone fireplace. Three decks overlooking gorgeous view of quiet inlet. Comfortable with baseboard heaters, carpet, hot shower. Drive to door. Great swimming/fishing. Large dock with canoe and rowboat and kayak, Bookcase with board games, dvds and pocketbooks. , cell reception and landline. For music lovers, the Festival of the Sound provides world-class classical entertainment July 18 to August 12 - or enjoy a cruise on the 30,000 Islands boat cruise and finish with a casual bayside dinner in one of Parry Sound's charming restaurants. Or just put up your feet on the deck, watch the birds and relax. Owned by a professional photographer. 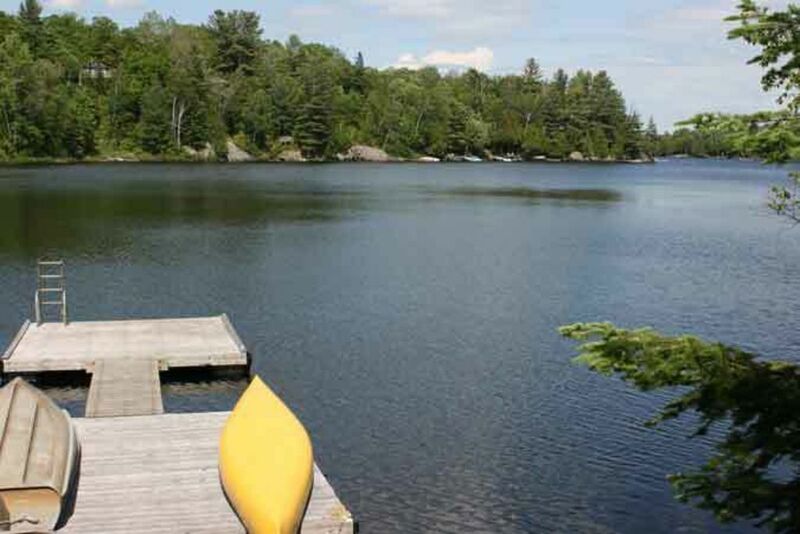 September is the best time of year - warm water, crisp air and a reduced rate of $1000 per week. Small sandy beach, large dock with 20 feet depth of water at the end - excellent for swimming, fishing or mooring a boat. Whitestone lake is an inland lake that is 20 to 40 feet in depth, so it warms up quickly for comfortable swimming. We are in a small bay minimizing boat traffic. Please contact for additional rate information. $1,500 per week during summer September, October - $1,000 per week. One week minimum.